RUSH Nottingham is now open! 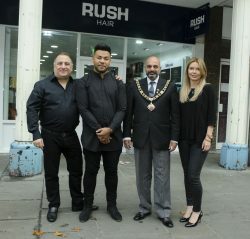 Aaron Smith, the salon manager, was joined by Operations Team, George Phouli and Fay Stephens. Aaron and the Mayor cut the ribbon on Saturday 22nd October. The grand opening took place at 20 Long Row, NG1 2DH. The salon was busy with new clients waiting to take advantage of the 50% offer. As the clients walked through the door they were offered a glass of champagne and a goodie bag to celebrate the opening. The Nottingham salon is in the city centre. Surrounded by the city’s bustling shops, bars and restaurants. The famous Market Square is near to the salon. The salon has a modern sleek interior and a range of professional hair care.